This chronology has some serious leaks, and we welcome you to contact us with any further information or clarifications. Many thanks to Tom Renner of E.H. Renner and Sons, Inc. for much of the information in this section. Also see Tom’s memoir in Something in the Water. For information about water pollution by Reilly Tar and Chemical, see the Creosote Plant. In 1891 the Minneapolis Land and Investment Co. platted 2,000 acres in the heart of St. Louis Park. The company retained the right to install, among other things, water or gas mains or conduits. In 1911 Leslie Max Renner, Sr. moved to St. Louis Park. Max had come from a family of well drillers in Berlin, Germany, and had established the Max Renner Well Company in south Minneapolis in 1895. By the turn of the last century, the Park was growing and each new home and business required its own well. Max moved his business west when he found that he was spending too much time travelling back and forth with his horses and wagons. In December 1918, Max Renner, Sr. and his 19-year old son Percy were killed at 44th and Wooddale by the high speed Excelsior Street car. It was a very foggy morning and a newspaper account reported that the road and the streetcar rails were wet. The Max Renner Well Co. was taken over by Leslie Max, Jr., and his brother, Edwin H. Renner. A third brother, William, was installing windmills for another company. 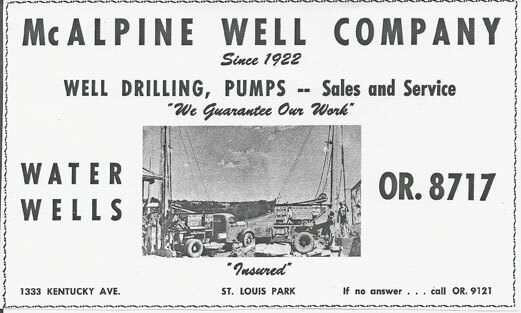 The McAlpine Well Company was located at 1333 Kentucky Ave. at Wayzata Blvd., according to the ad below from the 1951 directory. 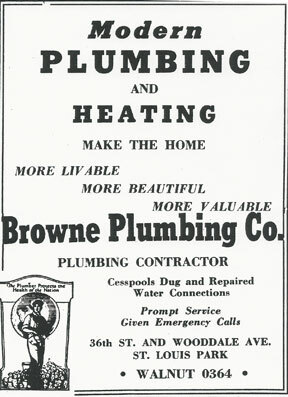 In 1924 Tom Motzko became Park’s first (and for a short while only) plumber. Tom Motzko Plumbing continued through three generations until the company closed in 2016. Also in 1924, plumber Gust Hoglund started plying his craft in the Park, from his home located just southeast of Wooddale Lutheran Church. By 1961, the one-man operation had grown to a plumbing and heating corporation employing 50 people and headed by Gust’s son Don. The office had moved to 7420 West Lake Street, which was built in 1955. Sewer District #1 was approved in April 1930. Alexander and Bradley were the Village Engineers. The Park water system was installed with WPA help. The first plumbing ordinances were passed on July 9, 1930. Joe Williams was appointed both Fire Chief and Superintendent of the water system. He was succeeded by Ira Vraalstad, who and had done a lot of the work for the contractor who put in the original water mains. The first patron signed up to be connected to the water main on August 25, 1930, was the Church of the Holy Name. This is probably Holy Family Church, which was started in 1926. A certificate was made out, in lovely longhand script, each time a building was connected to the water main. One local plumber who did a lion’s share of those early connections was Tom Motzko. In 1931 he was found to be plumbing without a license, but the Village Council gave him the chance to take the test. At the Village Council meeting of April 25, 1932, the council awarded contracts for the immediate construction of the waterworks system which it has been planning for several months,” reported the Hennepin County Review. The McCarthy Well Company won the contract to dig the well ($1,775), and the Chicago Bridge and Iron Works won the bid for the tower and tank ($6,745). In 1933 E. H. Renner left the Max Renner Well Co. and went into business for himself, forming the Edwin H. Renner Well Drilling Co. His brother Bill also had a well drilling business on Minnetonka Blvd. just west of the current Highway 169. Max’s son Leslie Max and then his son Les stayed with the Max Renner Well Co., until the early 1960s. It moved to Highway 7 by Nordic Ware and then to Hopkins. In the 1933 Street Directory, the Water Department reported that there were 329 water meters installed. Park pumped its first local water, which stunk. Stank. 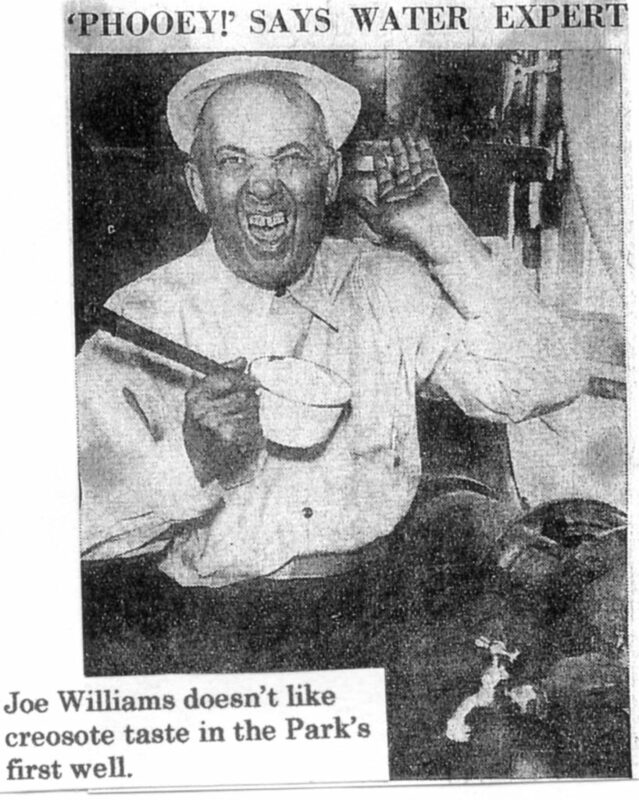 The September 3, 1933, Minneapolis SundayTribune showed Joe Williams with a horrible expression on his face as he tasted the local brew – the headline read: “Phooey! Says Water Expert.” See Republic Creosoting for much more about the leaching of creosote into St. Louis Park’s water supply. In 1934 Joe Smith, 4133 (35) Zarthan, advertised as a well driller. His wife’s name was Bertha. In 1932 the McCarthy Well Co. drilled a 16 inch well behind the old fire station at 36th and Brunswick. Bergerson-Caswell, a company from back East, built the 180 ft., 100,000 gallon water tower. It was designed to serve 600 customers. After using the creosote-tasting well for about eight months, the Village Health Department shut it down, and a connection was made to Minneapolis city water at France Ave. and Minnetonka. The installation of these first water mains allowed the fire department to buy a pumper truck for the first time. City water pipes were installed on most streets and avenues. The McCarthy well was idled but not destroyed for many years. In 1935 Clifford J. Browne was issued a plumbers license. Browne’s home and shop were located on Wooddale, where he lived with his four children and wife Lorraine, who did the firm’s bookwork. Browne’s daughters remember his first advertising slogan, created by their brother: “This is Cliff – Drop Over Sometime.” The business came to an end in 1954 when Lorraine was killed as a pedestrian (by a city bus) on her way to church on Good Friday. Browne never got over the loss and had to be institutionalized for the rest of his life. For a memoir of their father written by his family, see Something in the Water. Ad below from 1951 directory. In 1937 the Max Renner Well Co. drilled two shallow wells at 29th [Minnetonka Blvd.] and Idaho. Water was pumped from the Platville limestone and the St. Peter sandstone to filter out the creosote. The location was chosen with the premise that groundwater flows from northwest to southeast in another effort to avoid the creosote. A deal had been made with a Minneapolis bank to put up the money for the well, and the Village would then purchase the water from the bank. The first well was 285 ft. deep, and hopes were high that it would serve the entire community. However, these wells were pumped too hard, they delivered a lot of sand, and the over-pumping pulled the creosote over. These wells were sealed by E.H. Renner and Sons, Inc. in the mid 1950s. A 1937 news article shows Village Health Commissioner Dr. Darby holding up a sample of the new water; he claimed that it was free from all bacteria and softer than Minneapolis water. The well drillers knew that it was harder than Minneapolis “river water” and that it contained about 3 parts per million of iron, which left stains. The water system was considered completed on June 17, 1938, serving 800 families. In 1940 Tom Motzko had 50 men on his payroll. He had plumbed the Park Theater the year before. In November 1941 construction started on the 500,000 gallon (and 23,000 in the riser) water tower located “250 feet south [sic] of the center of the Minneapolis-Excelsior Road” at Highway 100 (at Lilac Way Shopping Center). It went into operation about July 1, 1942, and cost $42,260. It was the Village’s second such tank. The sign “St. Louis Park” was donated by the Pittsburgh Des Moines Steel Co. The tank was demolished on September 1, 1994. Marie Hartmann noted that the Water Department was established on December 29, 1941. On June 26, 1942, the Dispatch reported that the Village used 18,550,000 gallons of water monthly serving 2,500 buildings. The water superintendent was Ira Vraalstad. On November 6, 1942, the Dispatch had a cryptic item saying that the bonding company would pay the shortage in the Water Department funds during the term of Mr. R.M. Porter. Porter had been arrested several weeks ago. The August 18, 1944 issue of the Dispatch reported a severe water shortage that cut water pressure in homes to nothing at certain times. The Fire Department was concerned that there was not enough water to fight fires. “Both pumps” were working full time but could not keep up with demand. Between five and six hours were required to pump the necessary 600,000 gallons of water back into the mains in order to bring the water pressure back to normal. During the previous week the tanks were emptied as early as 10:00 in the morning. In June 1945 The War Production Board lifted its restrictions against laying sewer lines and the Village Council was able to advertise for bids for jobs under $25,000. Many residents were waiting in line for sewer and water service. In the fall of 1946 Scotty Hudson was apparently living in the west half of the Village Pump House. The address given in 6021 W. 36th Street, but that’s not an address today. It was no doubt at the location of the first tower at Wooddale and 36th, now gone. In December 1946, Village Well #5 was purchased from Emil Duemke for $2,500. It was located west of Texas and south of 34th Street. In 1947 there was pressure put on the Village Council to extend the water system, but the village still owed $132,000 on its $480,000 system. The problem was solved in 1950 when they put out a $488,000 bond issue. In 1947 Ed Renner’s sons Edwin R. (“Eddie”) and Tom joined the company when they returned from the Service. An ad from the 1947 Park Directory shows a proud father at his desk and his two strapping sons standing by one of their trucks. The company name was changed from the Edwin H. Renner Well Drilling Co. to E.H. Renner & Sons. In May 1949 the Village bought 20,000 gallons of chlorine from Hawkins Chemical for 12 cents/gallon. For the water supply? From 1949 to 1951, John F. Hazalik and Son, Well Drillers and Pump Repair, was listed in the directory at 4615 Minnetonka Blvd. This building no longer stands. In mid-1950, a one million gallon water tower was built at the cost of $265,000. Tower 3 was built at 8301 W. 35th Street and served the Oak Hill area. Johnson Brothers Plumbing and Heating was located at 4514 Excelsior Blvd. in 1950. The company, owned by Fritz Johnson, seemed to move around a bit. By 1951 water mains served 6,500 users. Water was pumped by six deep wells, with the pressure delivered by three overhead tanks with a combined capacity of 1.6 million gallons. Here’s a local business from 1951, the days before central sewers. In 1952 complaints were made about people dumping sewage into the sewer manhole at 36th and Wooddale during working hours. Nels Larson was caught in the act. In 1953 water tower No. 4 was built at Cedar Lake Road and Louisiana. That same year, on September 18, there was a drowning in the water main trench at 23rd and Hampshire. In 1956 the City Council passed an ordinance regulating the licensing of persons installing water softeners. Also in 1956, well driller Tom Renner came before the council to alert them to the fact that people were taking pumps out of their wells and using them for sumps. An ordinance was ordered regulating abandoned wells. In 1958 E.H. Renner & Sons incorporated, and Ed Sr. retired that July. An ordinance licensing and regulating well drilling was enacted on March 10, 1958. The Ron-Son Sewer Service is listed at 4820 Minnetonka Blvd. (an office building) in the 1958 directory. By 1959-1960, sewer systems were in place throughout the City. In 1960 it was determined that 35 percent of all private wells in the Park were contaminated. Nitrites were found in the water, and indication of sewage recirculation. In March, three of the ten City wells (Wells 1-3 at Idaho and 29th) were shut down for contamination. Dr. Ellen Fifer, City Health Officer, argued for a municipal water system and the elimination of private wells. The D.A. Oil Company building had been built over the Milwaukee Railroad well, which was located just east of Wooddale Avenue, 150 ft. south of the tracks [later the site of the Unpainted Place]. In 1960 E.H. Renner and Sons was hired by the State of Minnesota to seal it. It was well hidden, and had to be located with the help of old pictures from the St. Louis Park Historical Society and from Harold Hofstrand, a local surveyor. The Renners had to jack-hammer the floor to find it, then slide a well rig (without wheels or a tower) to get over the well. They cut a hole in the roof, then hired a crane to re-install the rig tower. They cleaned out the 945 ft. well and pumped it full of cement from the bottom up. A 4 inch casing was grouted in for use by the U.S. Geological Survey. E.H. Renner & Sons moved out of St. Louis Park to Plymouth in 1960. They moved again to Ramsey, Minn., in 1972. Tom Renner’s twin sons Raymond and Roger entered the company in 1973. In search of more room and better proximity to new business in outlying areas, the firm relocated to a 50-acre tract in Elk River in 1985. The company is now in its fifth generation of the Renner family. In 1960 Mead Well Drilling was working 24 hours a day to dig well #11, to the distress of the neighbors, who complained to the City Council and got them to cut it down. Rusty water was addressed in 1965 when two iron removal treatment plants were put in, one at 42nd and Zarthan, and one at Alabama and Cedar Lake Road. The contractor was Peterson-Templin. Despite the delay, Park was the first community in the area to fluoridate its water. On April 11, 1960, the City Council 5 to 2 to approved the purchase of equipment to add fluoride salt to the municipal water supply. The $7,226.50 contract for equipment was awarded to Wallace & Tiernan. The City Council meeting was jam-packed with citizens who were both for and against the measure. In those days it was common to hear the charge that fluoridation – put in the water to strengthen teeth – was a “communist plot.” Other possible uses were to “poison the public, get rid of waste materials at a profit, and unlawful foistering of medication upon the people.” Speaking for the measure were Dr. Robert Green of the St. Louis Park Medical Center, dentist Dr. Walter Johnson, Dr. Jordan from the Minnesota Department of Health, and a representative of the Jaycees. The equipment, some of which had to be made to order, was to be installed at seven municipal well sites: Idaho and 29th (2); Natchez and 41st (well no. 4), Wyoming and 34th; Zarthan and 42nd; Louisiana and Cedar Lake Road, and Lancaster Ave. and 16th. Charles Friedheim came before the City Council and requested permission to place an antenna on a city water tower. The Council voted no, but it turned out that the Minneapolis Gas Co. had one, the city attorney was instructed to negotiate a lease, and the city manager was told to develop a policy. The 1.5 million gallon reservoir near the intersection of Yosemite and Vermont was put into operation in September 1963. It was built by Minneapolis Tank and Manufacturing, and necessitated the removal of the house at 4231 Yosemite. Property was also purchased from Mrs. Anne Spencer, 4349 Brookside, for $3,000. In 1981 Tom Renner retired from E.H. Renner and Sons, and his brother Eddie retired two years later. The firm is now owned and operated by the twin sons of Tom Renner, Roger E. and Raymond T. Renner. It is the largest water well drilling business in the State in Minnesota. In May 1981 the city announced that it would like to sell Park’s first water tower, built in 1932. It was located at 37th and Brunswick, which was convenient for all the Central Jr. High kids who constantly changed the name of the City to St. Louis Bark. The tower held 100,000 gallons, and too many instances of overflowing led to its shutdown two years earlier. The well beneath the tower had been closed for 30 years. The tower was primarily used as an antenna for a civil defense radio operation that met in the building beneath the tower. Plans were to sell the structure to Color Ad, a nearby business; $400 for the land, with the company dismantling the structure. Follow-up information is scarce, except that the structure was torn down in 1983. In 1982 the City hooked up to Plymouth’s water system to provide water for the Shelard area of St. Louis Park, at a cost of $30,269. In 1983 well #17 was completed at a cost of over $400,000. The well had to be drilled to meet some unique specifications so that contamination from aquifers close to the surface would not reach the well. Looking suspiciously like the Tidy Bowl man, a water tower inspector was paddling in a rubber raft inside the tank near Highway 100 and Excelsior [Blvd.] when something unexpected happened. As the half million gallons of water were released from the tank, he paddled around the interior Nov. 2 looking at the paint and the structure for possible damage. “When the water was down to the last couple feet, the inspector used his paddle to swish away the murky water to get a better view of the bottom of the bowl,” said Jim Grube, director of Public Works. Grube compared the water draining out of the water tower to the vortex of a sink emptying. When the inspector was using the paddle to clear the water, his raft got sucked over the riser pipe, the 24-inch center pipe that carries water from the underground to the bowl. Realizing the potential danger of the vacuum being created, he tried to use the paddle to get the raft off the grate covering the riser pipe. When that effort failed, “The inspector took his knife out and stabbed the raft trying to break the suction, but it was too late,” Grube said. The walls of the riser pipe collapsed. Grube said the inspector, Shawn Mulhern of AEC Engineering, was scared but not physically hurt. The center pipe currently resembles a flattened straw. That same water tower was dismantled in November 1994. At first, redevelopment plans worked around it, thinking it was too expensive to take down. One plan for the redevelopment of Lilac Way Shopping Center was actually called Tower Place. The tower was ultimately replaced with a one million gallon tower located in the Belt Line Industrial Park south of Highway 7 and east of Highway 100. Every year the City produces a Water Report that provides the results of its water monitoring activities. In 2003 water tests showed increasing levels of alpha radiation, which has been linked to cancer and other diseases. The City upgraded its water treatment plants and used hydrous manganese oxide to remove the radium. That process was completed in 2012. Read much more in Seth Rowe’s article in the Sun Sailor, February 21, 2013. 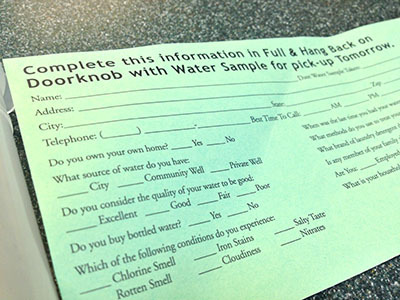 In December 2012 the City of St. Louis Park warned residents about a water testing scam in which an unidentified third party may be trying to obtain personal information. The scam involves a small tube being left at a residence along with a card that asks for personal information (see photo below), such as household income. This is NOT coming from the city–if the city was testing your water, you would be contacted beforehand via official city letterhead. THIS IS A SCAM!! DO NOT RESPOND!! The water system currently consists of 11 active wells, 6 water treatment facilities, three one million gallon water towers, four reservoirs with a capacity of 6.5 million gallons,148 miles of underground water main, and 1,700 fire hydrants. 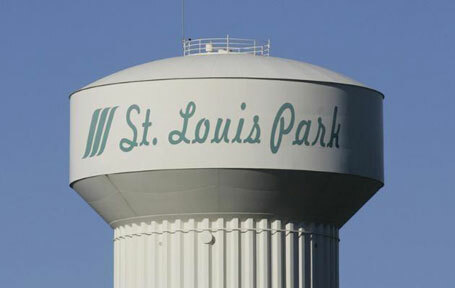 The following is an attempt to list St. Louis Park’s water resources. The information was gathered from several sources, including Village/City Council minutes. It is NOT official, complete, or guaranteed correct, but a work in progress. If you have any insight into these facilities, please contact us. Tower 3 8301 W. 34th at Wyoming – Elie Park 1 million Oct. 1950 Pittsburgh-Des Moines Steel Co.
Tower 5100 Park Glen 1 million 1994 Pittburgh-Des Moines Steel Co.
Reservoir 6 4241 Zarthan 1.5 million 1963 Mps. Tank & Mfg. Well 13 1200 gpm 1964 Layne-Minn Co.
An S indicates that the well is seasonal. Closing dates in parentheses are for wells that were initially closed when PAHs were first detected. Information in brackets is suspect. One source indicates that three municipal wells were drilled north of the Creosote Plant in 1938, 290 ft. into the St. Peter aquifer. Depths of the active wells are given on the Source Water Assessment.